Yesterday (February 27, 2018) we did the annual burn of the tallgrass prairie on the south slope of Pleasant Valley Conservancy State Natural Area. 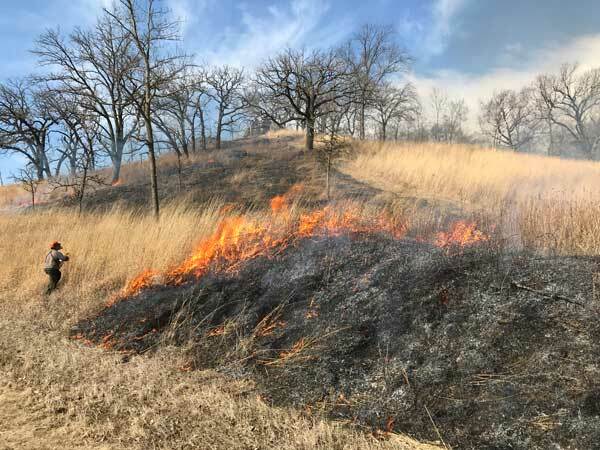 Because of the extensive bur oak savanna on the upper ridge, most of the burn was conducted as a backfire. 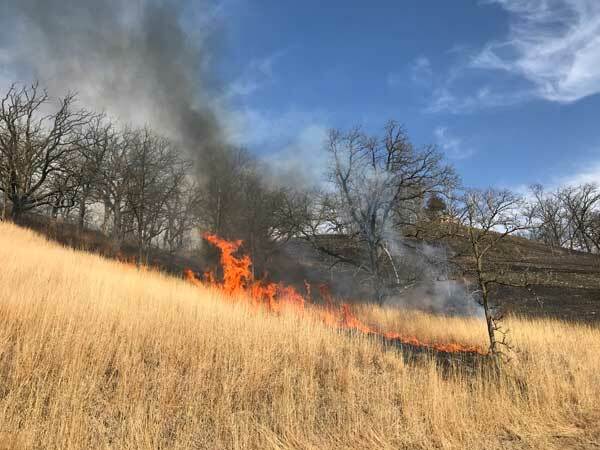 However, there are no trees on most of the lower slope so to speed up the process, a headfire was used. The principle fuel is little bluestem and Indian grass, with a few patches of big bluestem. 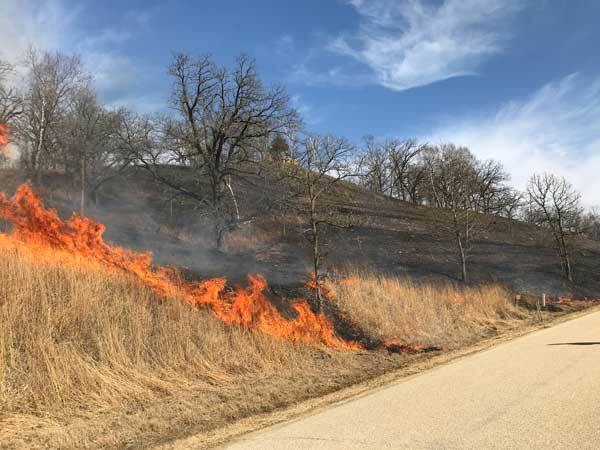 Yesterday the wind was gusty and variable, so that the grass burned either quietly or in quick bursts as the wind intensity varied. The photo below is typical of the headfire. After the burn was over, Kathie noticed that on the lower slope the fire residue was in narrow linear strips, with white ash alternating with black ash (black char). According to the fire literature, white ash is a product of complete combustion and black ash is the result of incomplete combustion. I assume that when a strong gust of wind passed over the burning grass, the burn temperature rose and complete combustion occurred, leading to white ash. When the wind was less strong, the temperature was less, and incomplete combustion produced black ash. The interesting thing is that there were several alternating strips of white and black. The smoke in the photo below shows the linearity of the wind. Unfortunately, I did not get a photo of the long linear strips, but the photo below shows short strips of white and black ash from the same burn. White ash is primarily inorganic substances such as potassium hydroxide, potassium carbonate, and non-alkali substances such as chloride and sulfate salts. The fragile leaf structure may be maintained temporarily but quickly disintegrates. Black ash (char) is primarily amorphous carbon. Per NOAA, Feb 27 noon was 55 F and 55% RH. Wind 8-10 mph from south. However, at PVC, the wind often shifted to the east. Typical open canopy of a savanna. This is a July view of the northwest side of Unit 10. 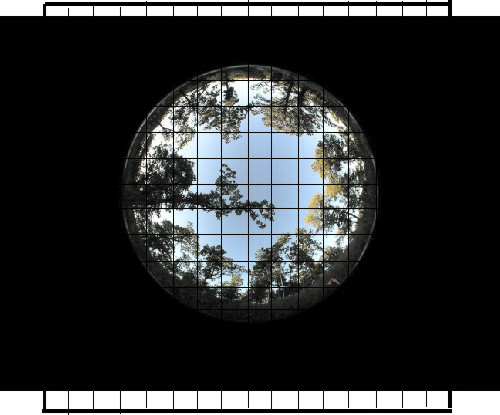 Quite a few methods for measuring a forest canopy cover exist, but on-the-ground methods are very time-consuming. However, with a good air photo, the analysis can be done very easily with GIS. 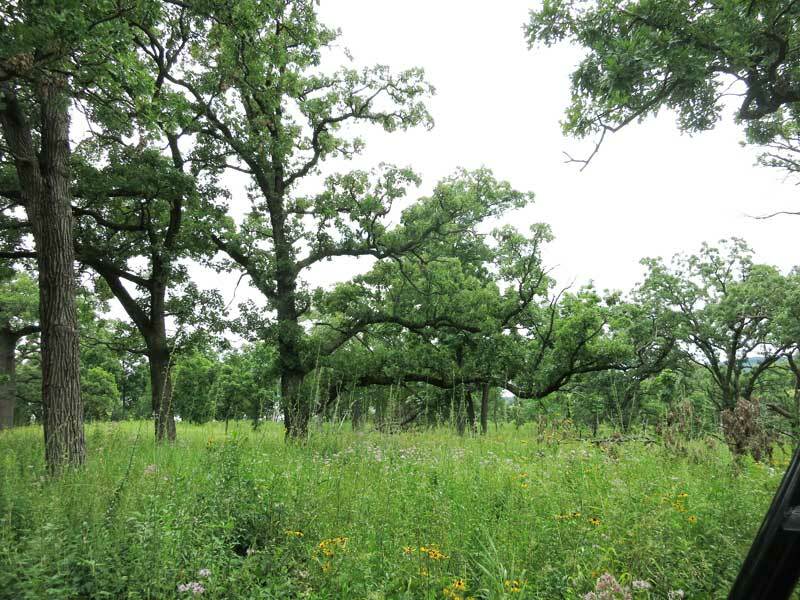 At Pleasant Valley Conservancy we have over 40 acres of high-quality oak savanna and a similar amount of oak woodland. Because of the heterogeneity of PVC, the canopy cover varies widely. I was interested in determining the coverage of some different sites and I was also interested in observing the changes in canopy coverage with time. 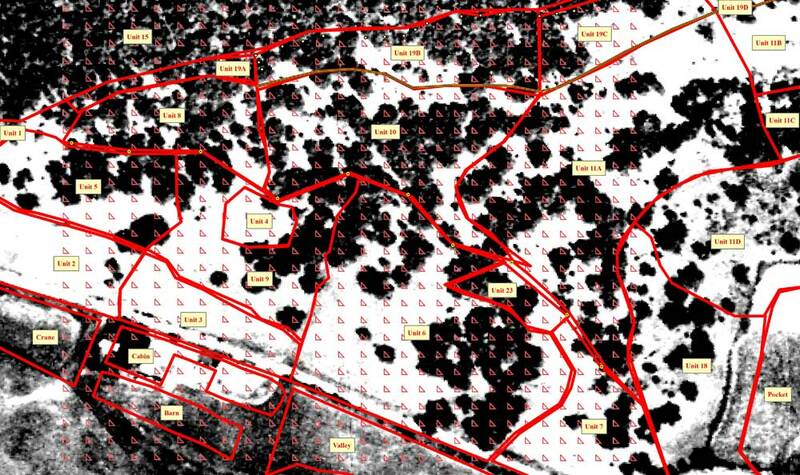 The general procedure in ArcMap was to overlay a digital grid of dots over an air photo whose sites are delineated, and count the percentage of dots that are over trees. However, because dots are difficult to see against the tree background, I used triangles, with the lower right corner of the triangle used as the “dot”. I created the grid in Corel Draw, saved it as a GIF file, and imported it into ArcMap as a layer. I used air photos from various years to give a wide time series. The oldest air photo was from 1937. I adjusted the contrast and brightness so that the tree images were sharp. Color photos were converted to B/W. Previously I had created a GIS layer that had the outlines of each management unit. Thus, I could determine the canopy cover for any PVC area. The photo shows the digital grid and management units on top of the 1937 air photo. A portion of PVC showing the dot overlay of the 1937 air photo. The lower right corner of the triangle was considered to be the "dot". The Unit labels can be turned off when doing the measurements. 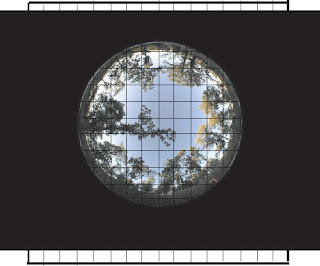 The accuracy of this technique depends on the density of the digital grid, and the ability to recognize the edge of the tree canopy. Some air photos were better than others, but all were of sufficient quality for my purposes. The drastic change from 1937 to 1990 shows what happens in the absence of fire. We started clearing the bad stuff in 1998 and by 2005 we had most of PVC cleared. In most units, the canopy cover is lower in 2005 than it was in 1937, probably reflecting the extent of our restoration work. As expected, there is little change between 2005 and 2010. Another procedure for canopy analysis is on-the-ground vertical photography with a fish-eye lens. This makes it possible to determine the canopy coverage at any site. I used this procedure when I was studying the distribution of purple milkweed, a classic savanna species. Most of the sites where purples were established had about 50% coverage. An image of a purple milkweed site with a superimposed grid is shown in the photo below. Vertical image taken with a fish-eye lens. Each grid corner represents a dot". I estimated 55% coverage for this image.